Strange. I was just in the elevator, having made a thrilling trip to the ATM and supermarket, when I heard something familiar playing on the recessed speakers. There is always music in the elevator, and the volume is always turned down to the ghostly edge of audibility. You don't hear it--you sense it through your pores. Still, I swore they were playing Sibelius's "Valse Triste." To make sure, I hit the Open Door button and held it until the alarm bell went off. Yep, it was the Sibelius. I had never heard this lovely, wistful fragment (I think of it as a 45 RPM single with a big hole in the middle) before March 2, when I attended a concert at the refurbished Alice Tully Hall. 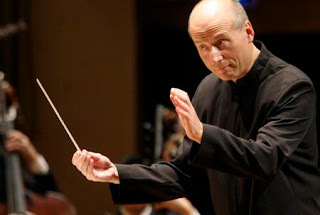 Paavo Jarvi led the Deutsche Kammerphilharmonie Bremen, and the bulk of the program was Beethoven: Symphony No. 1 and Symphony No. 3. Jarvi is a small, highly energetic figure. At some moments he seemed almost stiff, with a carriage not unlike a toy soldier. Then he would erupt into ferocious body language, including a great deal of micro-managerial action with the left hand. This brings up an interesting point. To my vulgar ear, Jarvi's tamped-down dynamics sounded wonderfully expressive, not showy. Of course I've never seen the score and have no idea what Sibelius called for. But I'm not a strict constructionist and assume that even the most manically exact composers (Mahler is a classic example) will elicit a range of interpretations. Speaking of which, I downloaded a version of "Valse Triste" the moment I figured out what it was. As it happened, the performance by the Gothenburg Symphony Orchestra was conducted by Neeme Jarvi, the father of Paavo. And you certainly couldn't accuse the elder Jarvi of dabbling in sound-of-silence gimmickry. Compared to his son's delicate reading, this one sounds more like falling down a flight of stairs. Still pretty, though.